Somerset Quilter and Teacher Rosemary Hillman is one of the guest quilters in a new book by Prize Winner Quilter Irena Bluhm, one of only 2 non Americans and the only one which has been Hand Quilted. The book “To Piece or not to Piece”, which had just been published concentrates on making Quilts which while they are designed to look as it they have been peiced are actually wholecloths which have then had colour added to accent the ‘pieced’ sections. 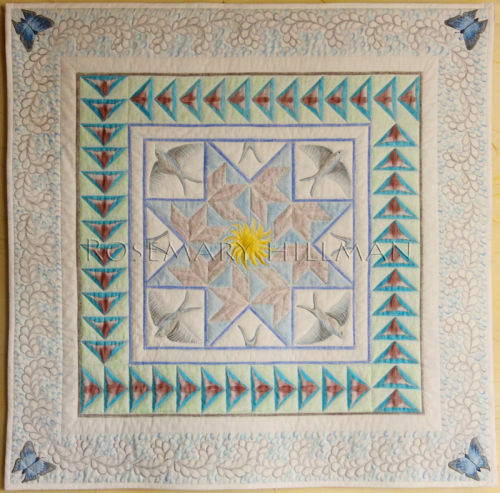 Rosemarys’ contribution is a Wallhanging called Flying South and utilises a very old paper peiced pattern, Flying Swallows and the well known Flying Geese block interspersed with faux applique Swallows and Swallow Tails. With a Sun at it’s centre and Curled Feathers in the border it is brought together with a series of borders being completed with Swallow Tail Butterflies in each corner. The Quilt Top is made from White Cotton Lawn and is Hand Quilted in a combination of running and back stitches. Derwent Pencils were used to add the colours on completion of the quilting. There are two images shown in the book, one if after the quilting and before the colour and decorative stitches were added and the other is of the finished quilt. Further details of this and other techniques can be found on Rosemarys’ website www.rosiequilts.com , where there is also a form to contact her directly. This Autumn/Winter, Rosemary will be offering the Flying South Pattern as a 2 day workshop, slightly changed from the way she made the original for the book. Visit Rosemary's website in the Workshops in the Gallery section to see images of two different workshops, the Table Topper and the Painted Flower Projects, using a similar method.